Dawn (seated, left) enjoys visiting with Indigenous research graduate students in Montana, October 2014. 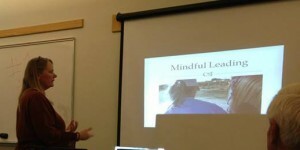 Jo makes a presentation about Tapestry’s Horse Ibachakali program to the “Soaring to New Heights” conference sponsored by WINGS Foundation, Denver, September 2014. Co-President Joanne (Jo) L. Belasco, Esq. came into Tapestry as Vice President, Chief Financial Officer, and Sponsored Research Officer in 1998, and served in that capacity until September of 2007 when she accepted the mantle of President. She received her J.D. from Suffolk University Law School in Boston in 1993 and holds a Bachelor’s degree in Psychology (1990) from Boston College. She worked as an attorney for the Boston Police Department and was Editor-in-Chief of Law Enforcement Publications for Quinlan Publishing before joining Tapestry. She is an experienced professional riding instructor and horse trainer. Belasco initiated and developed Tapestry’s Horse-Human Relationship Program in 2001. That program led to the creation of Horse Ibachakali, which incorporates horses, mindfulness, and Indigenous worldview to teach people about the relationship between humans and nature. In 2018, she launched Tapestry’s the Land and the Law Program, which helps people reconnect to nature by exploring the connection between law and the natural world. She also teaches about areas of environmental law so that people can understand issues concerning the Land, particularly in areas sacred to and inhabited by Indigenous people. She is also an ecopsychology educator and carries out scholarship in the fields of ecofeminism, spiritual ecology, and the horse-human and nature-human relationships. Click here to meet the rest of Tapestry’s staff: the Mustangs and other horses who work as healers and teachers in our programs.